The work plan of IEA SHC Task48 addresses quality assurance and support measures for ‘Solar Cooling Technology’ with a strong focus on solar heat driven chillers like ab- and adsorption cooling machines. 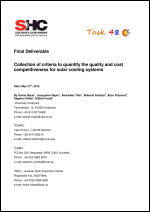 Nevertheless, activity B2 of SHC Task 48 lead by Austrian partners is dedicated to keep an eye on the open cycle principle with respect to new technical research and developments and as well to produce an extensive report on Good Practice examples of existing solar heat driven desiccant evaporative cooling (SDEC) systems. A desiccant evaporative cooling (DEC) system fulfils all tasks of an air-conditioning system: a) temperature and humidity control and b) control of hygienic air quality by supplying fresh air. Generally speaking the DEC technique applies three thermodynamic principles to treat air without using conventional compression chiller technology: a) dehumidification of supply air with the help of sorption material, b) efficient sensible heat recovery and c) cooling of supply and return air by using evaporative cooling effect. The solar heat is introduced in order to discharge the sorption material loaded by water vapor of ambient air. A profound DEC technology introduction is written in the 3rd edition of the ‘Solar Cooling Handbook’ . General targets of the B2 activity are: •	To support quality assurance and support measures for SDEC technology •	To give an overview about worldwide installed SDEC systems •	To express newest R&D activities •	To highlight on existing quality labels of SDEC subsystems •	To produce helpful guidance in order to stimulate stakeholder to realize SDEC This activity aims at producing a comprehensive report on quality assurance and support measures for ‘Solar heat driven desiccant evaporative cooling systems’. 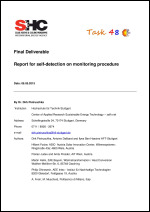 This SDEC technology is not the major focus in the SHC Task 48, but a limited number of activities contributors tried to observe and highlight on one hand new R&D results and on the other hand to document on GOOD PRACTICE CASES of already operated and monitored SDEC systems in three different climatic regions. Finally this cooperation in the framework of the International Energy Agency generated a report with the following chapters: CHAPTER 2 - WORLDWIDE INSTALLED SDEC SYSTEMS, This chapter document on the latest updated worldwide survey on existing solar air-conditioning DEC systems. According to the market survey conducted already in the previous SHC Task 38 , solar heat driven DEC systems have a low market share with regard to the other closed cycle systems (absorption and adsorption chillers) driven by solar heat. The survey identified 30 different SDEC systems, where a different concepts and technologies are applied. This chapter allows getting an overview into the variety of worldwide operated SDEC systems. CHAPTER 3 - NEW TECHNICAL DEVELOPMENTS Chapter 4 provides documentation on some R&D activities on four solar heat driven air-conditioning concepts and systems. The technical scope of this data collection is not limited to any specific sorption technology, but there is a dominance of open cycle application. There was not a fix structure given thus the authors decided what and how to present their R&D work. CHAPTER 4 - EXISTING QUALITY LABELS OF DIFFERENT SUBSYSTEMS OF SDEC SYSTEMS The purpose of this chapter is to describe the existing quality labels, standards and certifications to define the performance specifications of desiccant wheel and DEC system. 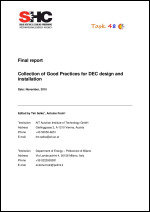 This chapter is divided in 4 parts: a) Existing certification for regenerative heat ex-changers; b) Standards for active dehumidification wheels; c) Manufacturers’ technical data for desiccant wheel and d) Desiccant-based dehumidi¬¬fication equipment; CHAPTER 5 – GOOD PRACTICE With this chapter three selected ‘Good Practice SDEC systems’ from Austria, Australia and Italy are presented along the entire project phase, i.e. design and operational phase. The SDEC projects were scientifically accompanied by SHC Task48 participants, therefore first analysis of simulation results of the SDEC technology are documented. The SDEC systems are equipped with measurement devices which fulfil the requirements of the 3rd level evaluation according to the IEA SHC Task 38 monitoring procedure . The energy performance of the SDEC systems operation is displayed by monthly values of both energy fluxes and key performance indicators. The ‘Good Practice SDEC system’ report on each system closes with findings and lessons learned in order to guide next projects; What quality and support measures lead to a successful SDEC system implementation with high energy performance, high quality of indoor comfort and high user friendliness for facility manager ? Starting from the statement of existing efficient system control (overview achieved in former IEA Task 38), a second generation of control system is needed to be developed which includes self-detection of faults and malfunctioning of the process based on a reduced monitoring. This new powerful functionality will be a key component assuring long term good reliability and performance of the system. This activity includes an update of good practice on the monitoring procedure starting from the experience and procedures developed during IEA SHC Task 38. However, possible system errors in solar cooling systems are diverse and reach from component defects over simple sensor faults to real control problems. Therefore, as a basic for new developments of automated fault detection systems within working group B6 first a categorization of typical system errors has been carried out. For each fault category typical errors have been collected and possible methods for error detection are discussed together with necessary monitoring equipment. In the last part of the document possible implementations of automated fault detection systems within local system controllers and within centralized internet based system observation systems are shown. For the development of a systematic error detection system, it is required that first of all the possible system errors are collected and sorted in logical error categories. Based on this error detection, methods can be developed for each category and type of error. To reach these goals the following steps were used within working group B6: -	Collection of the different typical system errors which occurred in different demonstration sites -	Characterization of these system errors for the different solar cooling systems -	Development and documentation of possible methods on how the most common system errors can be detected (sensor based and simulation based) -	Definition of minimum required additional sensors for the application of improved fault detection methods The present document summarizes the work performed by and the information collected within working group B6. This includes experiences made in many different demonstration projects with solar thermal heating and cooling applications. Furthermore, ongoing developments in the field of automated fault detection methods for the different error categories are described. 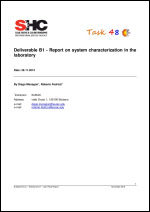 The main aim of the document is to give the reader an overview on the typical system errors and possibilities for a fast detection using automated system observation methods.